Wednesday, June 8, marks Meredith Vieira's last day as co-host of NBC's Today. Since joining the broadcast in September 2006, Vieira has brought staunch liberal advocacy to the morning news program, following the model of her predecessor, Katie Couric. NBC certainly knew what it was getting, as Vieira frequently pushed her left-wing perspective as one of the moderators of ABC's The View from 1997 to 2006. News reader Ann Curry will take over for Vieira, maintaining the broadcast's liberal tilt. The Media Research Center has compiled some of Vieira's most biased moments, from her later years on The View through her nearly five years on Today. "You know you are the equivalent of a rock star in politics....Many people, afterwards [after Obama's 2004 Democratic convention speech], they weren't sure how to pronounce your name, but they were moved by you. People were crying. You tapped into something. You touched people. What did you tap into that, that was missing?...If your party says to you, 'We need you,' and, and there's already a drumbeat out there, will you respond?" Meredith Vieira: "I think the hardest thing is, is not getting emotional because it is such an emotional morning, you just want to, you want to laugh, you want to cry. It's, it's so moving [Obama's inauguration]. And it hits you that you will probably never see anything like this again. It's quite something." Former Reagan speechwriter Peggy Noonan: "I keep thinking of the, the old poem. The end of the old poem about the French Revolution that says, 'Bliss was it then to be alive, but to be young was very heaven.' You're seeing so many young people here." Noonan: "It's very moving for them, very beautiful." Vieira: "Well I'm not young but I'm blissful, that's for sure." — Exchange on NBC News' January 20, 2009 live inauguration coverage. "Well some may question his policies but no one can question President Obama's precision. Take a look at what happened when a pesky fly got on the President's nerves last night during an interview with CNBC's John Harwood....Oh don't mess with him. Jeez! Look how neat he is though, the President. Takes his fly and left....It's, it's like a subtle, subtle warning to the Republicans." Meredith Vieira: "Where do you think he [Osama bin Laden] is? Everybody's wondering where the heck he is, where do you think he is?" Former President Bill Clinton: "I think he's probably in, I have no intelligence, okay? I think he's probably-"
Vieira, interrupting: "You have lots of intelligence." Clinton: "No, I mean government intelligence." Vieira, laughing: "I know, I'm kidding." "Look, it's a very historic day on Capitol Hill. Nancy Pelosi the first woman to become Speaker of the House. I'm excited as a woman to see that happen." — Vieira touting Nancy Pelosi becoming first woman Speaker of the House, Today, January 4, 2007. "You listened to the Governor's [Charlie Crist's] announcement I'm sure. Is this a case where he has deserted the party, or once again has your party become so intolerant that it doesn't have room for moderate voices?" "Senator DeMint, if I could start with you, back in July you said, 'If we're able to stop Obama on this,' meaning this health care reform bill, 'it will be his Waterloo, it will break him.' Well, the bill is now law and a former speech writer for former President George W. Bush has said Republicans messed up big by adopting the 'Hell no!' approach to this bill. So do you still feel it is the President's Waterloo or is it now your party's Waterloo?" — Vieira to South Carolina Senator Jim DeMint on Today, March 24, 2010. 'What's So Good About' Bush's Failed Tax Cuts? "One of the key issues also heading into the midterm elections, is this expiration of the tax cuts, Bush's tax cuts....These tax cuts have been in existence for quite a while, these Bush tax cuts. If they were designed to stimulate the economy and to create jobs, they didn't succeed. So what's so good about them?" "One man has made it his mission to warn the world about the dangers of an Earth that is heating up: former Vice President Al Gore. He won the Nobel Peace Prize for his work just last month....Mr. Vice President, good morning to you. I'm gonna be the first one here to say congratulations....Back in 1992, the first President Bush called you 'Ozone Man.' He ridiculed your efforts to bring attention to climate change. He even called you crazy at one point. So is this [prize a] vindication, of a sort, for you?" — Vieira to former Vice President Al Gore on Today, November 5, 2007. "So I'm running in the park on Saturday, in shorts thinking this is great but are we all gonna die? You know? I can't, I can't figure this out....there were record breaking temperatures across the, 72 in New York City, 69 in Boston on Saturday. A lot of people wondering is it global warming or something much simpler?" Meredith Vieira: "You know on a personal note, you said last night the first call you made after your victory was to Ted Kennedy's widow, Vicki." Senator-Elect Scott Brown: "That's right." Vieira: "How comfortable was that for both of you, knowing that you plan to do whatever you can to derail what Ted Kennedy called, called 'the cause of his lifetime,' which is health care reform?" "Retired U.S. Army General Wesley Clark is a former Democratic presidential candidate. He wants Congress to pull Rush Limbaugh off the Armed Forces Radio Network, which is funded by taxpayers....I'm sure there are some people who might ask you, why don't you just brush off these comments by Limbaugh, like an annoying gnat instead of legitimizing them and bringing more attention to them?" 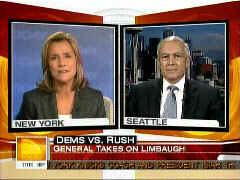 — Vieira interviewing Clark on Today about Limbaugh's "phony soilders" comment, October 3, 2007. In fact, Limbaugh was talking about leftist anti-war groups touting tales of U.S. atrocities from Jesse Macbeth, a soldier who flunked out of basic training and who is going to prison for making it all up. Meredith Vieira: "Is it possible that this decision to commute and not pardon [Scooter Libby] will backfire with the President's conservative base, whose patience with him is already tried?" 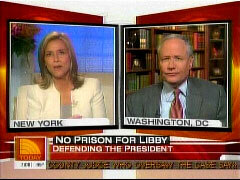 Weekly Standard's William Kristol: "No, no....Look at all the screaming and yelling. Look at Joe Wilson's ridiculous comments just now...."
Vieira: "Why do you say those are ridiculous, sir? There are many people who feel that this was a travesty of justice. So those who believe that are ridiculous?" — Exchange on Today July 3, 2007. Co-host Meredith Vieira: "What about her [Sarah Palin's] credibility? You just heard this report, she claimed her state produced 20 percent of the energy in this country. Not true. Her campaign aides say she had visited Iraq. Not true....What about her trustworthiness?" Conservative Bill Bennett: "I think this is pretty small beer, really, pretty small stuff. She was in Kuwait. Did she step foot in Iraq? Maybe, maybe not....This is not big stuff." Vieira: "How is that small stuff? How is that small stuff?" Bennett: "Well, because it is small stuff." — Exchange on Today, September 18, 2008. Wouldn't We Be 'Better Off' With $6 a Gallon Gas? Meredith Vieira: "Would, would we be better off, sir, if gas prices were even higher, if it were four, five, six dollars a gallon? Wouldn't that provide the incentive we need to come up with alternative forms of gas and to stop this dependence that we have on foreign oil?" 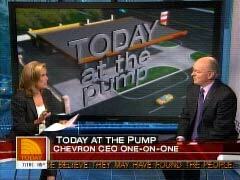 Chevron CEO David O'Reilly: "Well I think, I don't think many people would like to see gasoline that high." Vieira: "But would we be better off?" — Exchange on Today, June 21, 2007. "The point of The View was to give your views on various issues. There's nobody that doesn't have biases one way or the other. It's my responsibility once I'm on this show [Today] to put those aside. They have no place on this show. But there is nothing that I have said that I am ashamed of. I stand by anything that I've said." — ABC's The View co-host Meredith Vieira at an April 6, 2006 press conference announcing her new job replacing Katie Couric as co-host of NBC's Today. "Everything's been built on lies. Everything! I mean the entire pretext for war."